Google has published the Android Distribution Numbers for March 2017, and it is not looking good for Nougat. Android 7, the latest version of the platform, which debuted in August 2017, has just 2.8% of the Android OS market share & of which only 0.4% is for Android 7.1. 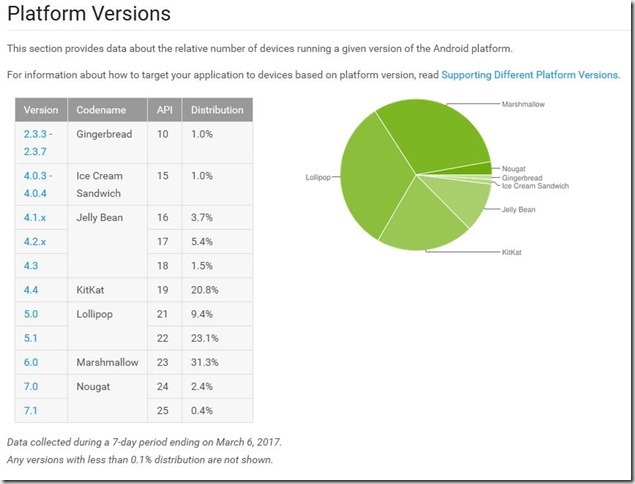 But, it did take a leap from 1.2% (0.9 and 0.3% for Android 7.0 and 7.1 respectively), to 2.8% in a month. This can be attributed to Samsung perhaps, which rolled out the Android 7.0 Nougat for its 2016 flagship devices, the Samsung Galaxy S7 and the Galaxy S7 Edge, last month. Still, Nougat’s adoption rate is much slower than Marshmallow’s, which was released in October 2015, and had around 2.3%. It grew to 2.3% in 5 months, and Nougat could only cross that mark in 7 months. Some OEMs with a very large user base, like Xiaomi, still have their devices on Marshmallow, which is something Google may want to look at. The Mountain View company had released Nougat earlier to help OEMs ready their devices for the update sooner, but that plan seems to have gone nowhere. Despite that, Marshmallow meanwhile with 31.3% (up by 0.6%) of OS shares, has once again failed to overthrow its predecessor, Lollipop, which has 32.5% after dropping just 0.4% from a month ago. Android 5.0 and 5.1 combined have held to the top spot for a very long time indeed. KitKat dropped 1.1% from 21.9% to 20.8%. Jelly Bean saw its numbers fall from 11.3% to 10.6%, while Ice Cream Sandwich and Gingerbread miraculously continue to hold on to their 1% shares. OEMs should really look at Google and provide proper after sales support for their devices’ firmware, instead of simply launching new devices. This is how you build a rock solid reputation, like Apple and Samsung have with their devices. OnePlus has also relied on such a practice for sales, and its worth applauding. But with the mid-range market offering affordable devices, the majority of the OEMs seem not to care too much about support, than filling their coffers.